It was only natural to be skeptical when you saw a 3D hologram of Minecraft being beamed onto a table, then being manipulated through touch and even sight commands. Microsoft has this tendency to promise big huge impressive technologies at E3, but then never quite follow through in the marketplace. Now that the press has had a chance to try Minecraft Hololens for themselves, the general consensus is…..yes, it’s all true. 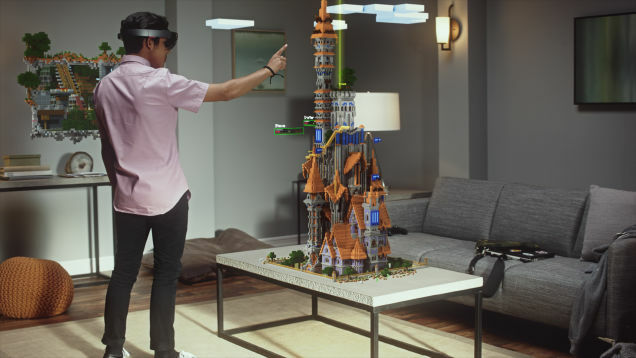 The glasses display Minecraft on any surface you look at, be it the wall or a table, and it responds to your swipes and pokes the way a tablet screen would. Scott Sten from CNet said: “By pinching my fingers or snapping them, I could click or drag the world around forward and backward, or up and down to reveal levels and caverns underneath. I was guided how to create a pin using my voice, and dictate a voice message for a sign: “library here.” I had fun looking around, peering in. I even created a second screen that floated on a wall next to me, that I could use while playing with the giant 3D model. Many of the reviewers admitted there were a few glitches in the programming and some found the glasses uncomfortable, but they were all satisfied with it and agreed Microsoft delivered what they promised. Will Hololens change the way we play Minecraft forever? …..Depends on how expensive it is.